There are lots of “busy night” dinners that I pull together often but have not shared in this space. Why, you may ask? Well, because they are the busy nights, when I am doing what so many of you are doing, too: trying to finish work, fold laundry, get the kids to and from their activities (Of course, even if the kids do the same activities their age groups always seem to practice at different times! )…you know what I mean. On these nights, I don’t take the time to get the camera out and snap a picture of our dinner plates. Every five minutes count on these nights, especially if those five minutes mean the difference between sitting down with the kids for a few minutes or not. Anyway, when we all enjoyed this meal last week, I commented that we eat this so often yet I have not typed up the recipe. My kids said I really should. I make special note of this because sautéed kale may not be what you expect kids to love. Yet somehow, my kids — one of whom tends to be a little picky — love it. For them, I often serve with a side of toast. I like it when the egg yolk mixes in with the greens, making a flavorful sauce of sorts. A grating of fresh Parmesan or Manchego are my favorite ways to finish this off, but cheddar or your own favorite cheese — or no cheese — work well, too. These ingredients can be had on hand and prepped in advance. If I know the night will be busy, I try to wash and chop the veggies ahead of time. Even though the general rule is not to refrigerate onions, I often prep them in advance and store the chopped onions in a leftover deli bag in the fridge. They always taste fine. While I am on the “breaking the rules” subject, I will confess that I wash mushrooms, too. Conventional wisdom says, don’t do it. But sometimes mushrooms are really dirty. Before cooking, I plunge them in a bowl of water, remove the dirt, and then remove to my cutting board and chop. I don’t do this part in advance, however; once wet, I cook them right away and the texture is terrific. I think the key is not to soak them for long. For moms who think their kids may never eat kale, try starting with Kale Chips. Years ago, this crisp rendition seemed to present kale to my kids in a positive light. So, when they ate it in different ways, they were open to it. I’m not promising anything, but it may be worth a try! Sautéing the mushrooms long enough to cook out the mixture and render them golden brown creates a meaty texture and lots of satisfying flavor. For those who aren’t a fan, simply omit and cook the onions until nicely caramelized. Or substitute bell peppers or white beans — I like to sear those long enough to develop a golden crust. 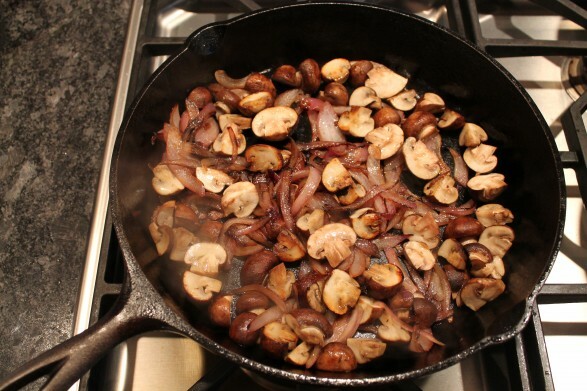 While I love the flavor the garlic adds and adore the meatiness of the mushrooms, I mark these as optional. When pressed for time, I simply sauté the onion, wilt the kale, and top with the eggs. Sprinkle with cheese, if desired. A large bunch of kale will serve four people. Top with one or two eggs per person, depending on appetite, and serve as is or with a side of toast or crusty bread. In a large, oiled skillet (I use my 12-inch cast iron skillet), sauté the onion over medium heat for 2-3 minutes, or until beginning to soften. Add the mushrooms, and cook for 5-7 minutes more, stirring occasionally, or until the mushrooms are golden brown. If your skillet becomes dry, add a drizzle of olive oil. Add the garlic, stir, and season with a little salt and pepper. While the kale is finishing, cook the number of eggs desired to your liking. I usually do over-easy or sunny side up, but choose your favorite method. Spoon kale onto plates, top with egg(s), and a grating of your favorite cheese. Serve with a side of toast or crusty bread, if desired. I like to keep the yolks runny so they serve as a sauce to the greens. If you or your kids don’t like runny yolks, you could certainly top the kale with scrambled eggs. Thank you for sharing sweetie! It looks wonderful! I have kale in my refrigerator and will be trying it this way. <3 and hugs! My pleasure, Debi! Always happy to share over your way! Love this dish. Would be great for a brunch too. My husband would certainly enjoy it to. Thanks for sharing on Thursdays Treasures. Always happy to share over your way, Christie! I love kale! This is a great recipe and as you note, great for a quick meal. Thanks for sharing! You are welcome, Patricia…So simple yet so good!! We have kale in our fridge right now! We got it from our crop share, I never know how to get Drew to eat it. Going to try this in the morning:) thanks Ann! Also, I got the chobani yogurt in the mail Tuesday. Hope this proves to be a good start to the day, Amanda…let me know what he thinks! So glad your prize arrived, too! 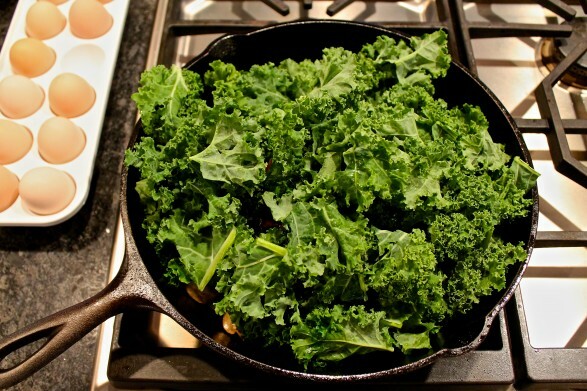 Do you fry the eggs separate, or are they cooked in the same pan as the kale? 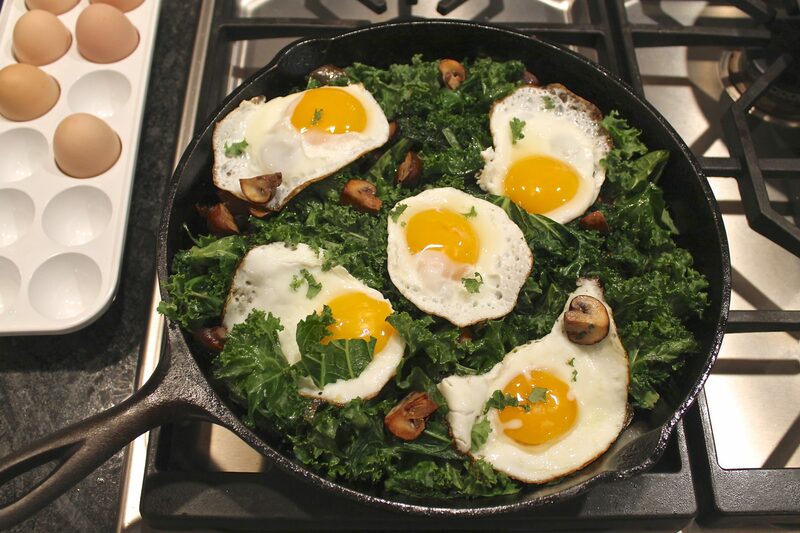 Cooking the eggs separately offers a little more control–and I do typically cook them separately–but you could nestle them into the kale and cover the pan for a few minutes as an option.